When I shared these with some fellow agile coaches, they were amazed. Neither of them had similar strengths – cue imposter syndrome – how am I supposed to be a coach if I don’t even “follow the rules” of what it takes to be one (and cue consistency). And that’s a the thing about a lot of agilists – they all have their niche and I’m more of a generalizing specialist – I know a little bit about a lot of things but there isn’t really one thing that comes to mind on what Natalie’s thing is (makes it difficult to write a book on something too). I guess there’s always Harry Potter. But then I think about it a little more and if we as coaches don’t have different strengths, then we’re all going to be the same and how are the practices going to evolve. Where are the new ideas, or the new perspectives on ideas going to come from? Homogenous traits is not what we need – but are my strengths contributing to that diversity in a positive way? But really, my strengths in someone who is supposed to be value individuals and interactions; consistency screams processes and tools. Achiever doesn’t always mesh well with success and failure as a team just as competition might hurt self-organization. While futuristic might be good at looking forward and planning, it can hinder paying attention to what is going on presently. And significance — yes, I’m a millennial snowflake. Now when I first looked at these again, I thought I saw correlations with my present behavior but then again this was from almost a decade ago (when I wasn’t really “being” agile nor was I coaching it). How could I give these a positive (or at least a realistic spin)? Competition in a healthy way is good. Competing against other companies from a product management and value perspective and helping to vet out competing priorities by finding a winner is vital. Futuristic can go right along with that, and also being a few steps ahead so I can ask the right questions around what could happen. Consistency is really about treating people consistently as well as knowing what you’re being measured against (when I ask about rules it’s not so I can break them or find a way around, it’s so that I know what they are and how to follow them). Significance – yeah I want what I do to be noticed and I want to be an important part of every team I work on or with. If I’m not adding significant value, get rid of me so I can try to do it somewhere else. And finally achiever. Well, I have a slight obsession with metrics and goals and knowing what I (or we) are trying to achieve will focus me on it and keep me going toward it in the future (these are really tying together now). Maybe not an imposter after all, but maybe just a different take on things. Now I’m going to find out the rules about self learning and buying books for work and see if I can re-take this strengths finder to see if anything has changed. I love this, Natalie! 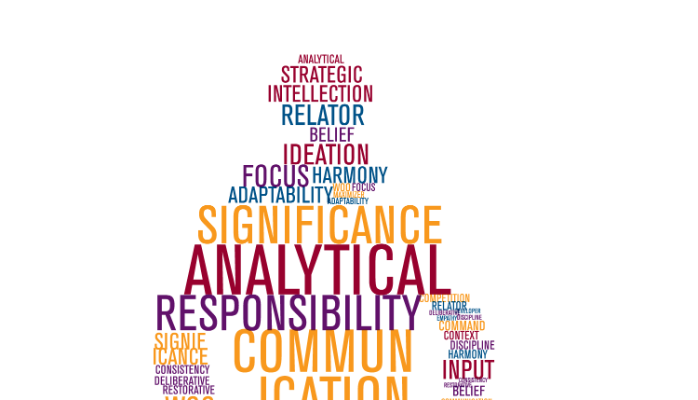 I absolutely love the StrengthsFinder concept, and love hearing about others’ strengths. Kudos for the self reflection, and for embracing YOU. You are so right that we all need different strengths to move this all forward.